Yesterday, Sunday the 17th, my son and I went fishing with some friends on their boat named Fish Tales. We had went out Saturday also catching lots of silvers and shakers, and ended up coming in with five kings between 8 and 20 pounds. On Sunday, we all were lazy and slept in when John called and asked if we wanted to go at noon, so we were headed across the bar about 1:00. We went straight out to 140-150' when we stopped and started rigging poles. My son Garret, who has been fishing with me since I finally talked mom into letting him go when he was 4 (he is now 11) had his pole rigged and in the water before I had even chosen a flasher for mine. It wasn't even 5 minutes when he grabbed his rod and said he had a fish on. As he reeled it in I didn't think there was much there until it was close to the boat and surfaced and my buddy John seen it. After that it ran straight down until Garrets reel was almost spooled out before he finally started gaining on it again. About ten trying minutes later I finally land him in the net. 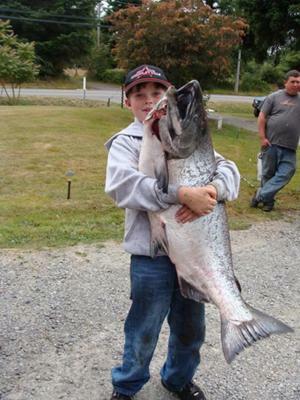 It was the biggest salmon I personally had ever seen and if I had only knew how big it was earlier I am sad to say that my son probably would have never made it to that pole and I would be telling you about the big fish I had caught. 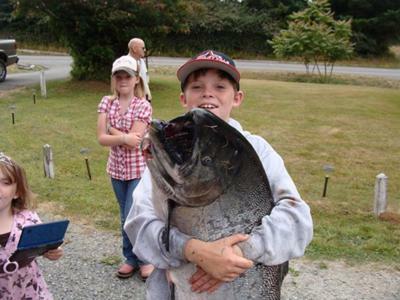 When we got it home we weighed it in at 44 lbs 12 oz. 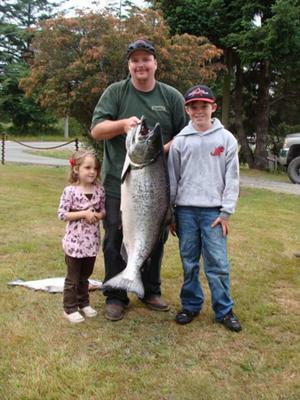 It is now the big fish leader at Englund Marine's big fish contest weighing in at 39.5 pounds gutted and gilled. He is so proud of his fish and I am so proud of him. Way to go son. Join in and write your own page! It's easy to do. How? Simply click here to return to Salmon Pictures.